Exterior, Tintype gallery, Essex Road (project), 2014. Courtesy Tintype. LONDON.- Tintype announces the second edition of its Essex Road Project. Essex Road II is comprised of eight specially commissioned short films by critically acclaimed artist-filmmakers, each inspired by the north London street from which the project takes its name, and where the gallery is also located. Five minutes or less in length, the films are back-projected onto the gallerys large window, and can be viewed from the street seven days a week between 4 and 11pm. Jordan Baseman: Over the course of a week, Jordan Basemen walked up and down Essex Road at night with a 16mm camera, taking near random, long exposure shots. Each time he reached the end of the film, he rewound and filmed over what he had already recorded. His aim is to create a psychedelic portrait of the street at night, with multiple exposure visuals that collide, overlap, compliment and disturb one another. Helen Benigson: Benigsons video is inspired by the hen parties that take place on Essex Road and thereabouts on Friday and Saturday nights. Using fast paced text, her film is a visceral celebration of this female ritual  carnivalesque, pulsating and anthropomorphic, referencing contemporary community, performance and what it means to share in the context of marriage and friendship. Benigsons video attempts to arouse libidinal and corporeal concerns within a nightlife framework of body, city and space. Sebastian Buerkner: Buerkners film is based on the premise of a night bus journey down Essex Road using his innovative animation techniques, cutting-edge digital technology and abstract imagery to create a multi-layered interpretation of a real-time situation. Ruth Maclennan: Maclennans film takes as its starting point the image of Essex Road as a place where lives have landed, and flourished, and mixed with each other in beautiful, unexpected ways. The film focuses on Zigni House, an Eritrean restaurant on Essex Road. Zigni is the creation of its cook, Haile, author of the first Eritrean cookbook. This is an edge-world, where a translucent veil separates the passers-by in the street from the private celebration unfolding inside the intimate theatre of the restaurant. Between the lines of Hailes story, and the images of the party, are hidden experiences of war and loss, but for the moment, these are held at bay. The film is a celebration of the movement and mingling of lives along the Essex Road. At the same time it hints at the contradictions and ambivalent atomization of contemporary life in the city. 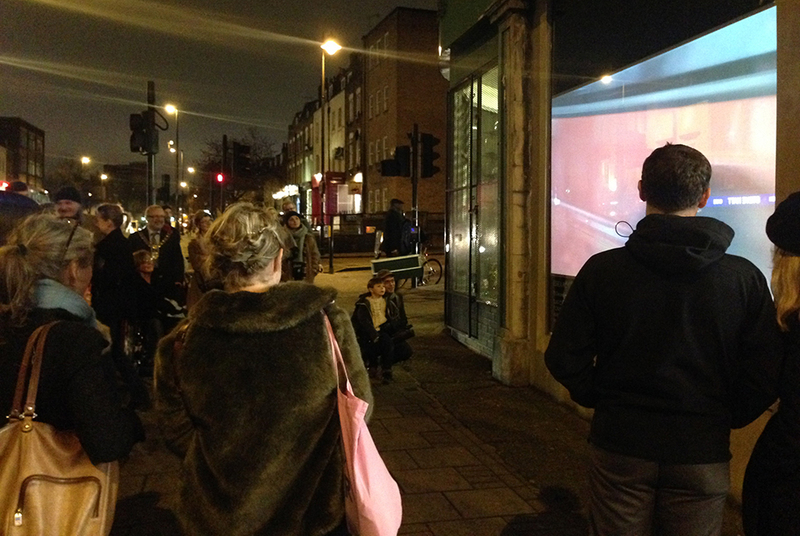 Melanie Manchot: Manchots film is a continuous tracking shot going down Essex Road. She invited a multitude of people living and working on or near the street to participate in this brief performance, which becomes a group portrait of the residents and shopkeepers on the street. Uriel Orlow: Playwright and author Joe Orton and actor, writer and collagist Kenneth Halliwell, Ortons lover and eventual murderer, lived in Islington. The focus of Uriel Orlows film is Edna Walthorpe - Joe Ortons fictional alter ego, conjured up by performance artists Adam Christensen and Marcia Farquhar. Orton used Ednas letters to goad authority into revealing their own innate idiocy and double standards. Filmed on the doorstep of Joe Ortons house, Edna's letters to the Ritz Hotel, church halls and food companies feel oddly familiar and contemporary. John Smith: Smiths film revolves around the deliberate misuse of the Word Lens Translator app for smart phones. Interested in how this software interprets (and especially misinterprets) images incorporating text, particularly the coincidental meanings that come about through the mistranslation of the cameras view, his piece for Tintype involved fixing his iPhone to the lens of his video camera and filming its screen as it attempted to translate a selection of shop signs, notices and street menus in the vicinity of the gallery. With the translation option set to translate from French to English the software became confused and tried to read English signs as French, as well as reading graphic architectural shapes as words.